The Sustainability Office is at the heart of all things green at Laurier. Since opening in 2010, the office has led the effort to lower Laurier’s overall greenhouse gas (GHG) emissions by 15 per cent by 2016. Laurier also participates in the Sustainable Waterloo Region’s Regional Carbon Initiative program – an organization started by two Laurier alumni. Laurier is achieving its target and has done so through integrated initiatives within all areas of operations, education and community partnerships. From energy management and climate action to innovative food systems projects, the Sustainability Office works to improve the sustainability of the university, while also taking into account its role within the local and global system. Recently, Laurier was recognized as a top performer for its sustainability coordinating and planning with a silver rating in the 2015 Sustainable Campus Index and Rising Star recognition. Use the Diverse Waste, Recycling and Reuse Program, properly dispose of your organics, batteries, e-waste, computer, cell phone and surplus furniture reuse, as well as florescence, wood and metals processing. Apply to the Sustainable Hawk Fund (SEED Funding): students, staff and faculty can submit applications to help grow sustainability ideas that benefit the Laurier community. Residence Move-Out Program: students can donate their unwanted and gently used items to local charities while they move out of residence. Contact Tyler Plante at tplante@wlu.ca for free passes to monthly Sustainable Waterloo Region events and speaker series. Intern with Young City Growers (YCG), a community shared agriculture plot that provides affordable, organic and local produce weekly to the Laurier community, located right on Laurier’s Northdale Campus at 66 Hickory St. W., Waterloo. Store your bicycles in Laurier’s storage unit near McDonald House. Fix your bike at the on-campus fix-it station at Mid Campus Drive. Register with Bikeshare to rent bicycles at University Ave. and Mid Campus Dr.
Use Travelwise to find discounted bus passes, emergency ride home services and carpooling databases. 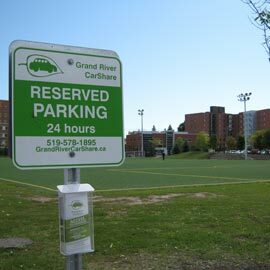 Join the Grand River Carshare program. Visit the Mino-Kummik Aboriginal Community Garden. Read more in Laurier’s Green Guide and Sustainability Map. Store your bicycles in Laurier’s storage unit near The Expositor parking garage. Take the Greyhound Bus or use public transportation. Carpool and gain access to central on-campus parking. Read more in Laurier’s Green Guide or find out about waste disposal. Follow Laurier’s Sustainability Office on Twitter at @LaurierGreen and Instagram at @lauriergreen.